About a month ago I set myself the challenge of knitting a cardigan. I've knit a few cardigans before but I don't think I've ever finished one is under 6 weeks before, Usually I get side tracked or wasn't really (project) monogamous to start with. This time however, something has been different and I have been ploughing along, maybe its the lovely cashmere/cotton blend maybe its because I know a lot of stash room will be freed up as a result of knitting nearly 450 grams of yarn. Then, last week, I had a bit of a moment where ordinarily I may have put it down and not picked it up for 6 months or even a year. What could possibly stop my momentum? It was the second sleeve. I finished the first sleeve in a state of complete self-satisfaction. I was pleased that it was done. I loved the way it looked. I was heartened that I would have enough yarn to finish the project and perhaps knit a baby hat to throw in gift drawer. Then the realisation set in that I was going to have to do it all again. My feeling of smugness was premature. I knew I had to get all those stitches back on the needles, knit another 96 rows, decreasing as I went and then swap needles and do a cuff...ugh Hadn't I just done that?! Why is it necessary to have two arms?! I have got to this stage before, and done what many knitters have done before me, bundle it into a bag and chuck it in the back of the cupboard. Clever knitters remember to chuck all the needles they have been using on the project in the bag too and keep notes of any modifications they made. Then when the long forgotten project is rediscovered, usually during cleaning or whilst procrastinating to avoid another task, the knitter exclaims "I only had one sleeve to do! Why didn't I finish this at the time" followed by "That's where my favourite 5mm DPN's got too"
I told myself it wasn't going to happen this time. I set myself an deadline, I'm an odd one, I like deadlines. I picked up the stitches and got on with it. I now have 10 rows of knitting, the ribbed cuff, the bind off and sewing in to do...I might even finish this tonight. 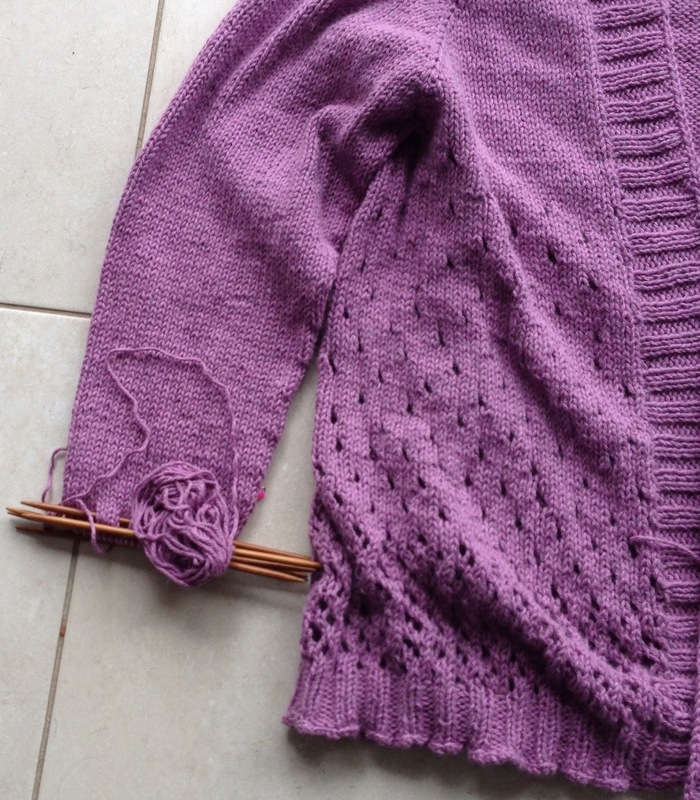 That is, if I stop procrastinating and writing blog posts instead of knitting. It's really lovely isn't it! The pattern! Do you think this experience will change the way you tackle further projects like this? No more UGO's in the back of the cupboard? The deadline definitely helped but 2/3 of that last sleeve were a slog. When I used to knit on straight needles and seam I used to knit sleeves TAAT (two at a time). I felt so smug doing it and never had the second sleeve but then I'd have to seam the whole thing. 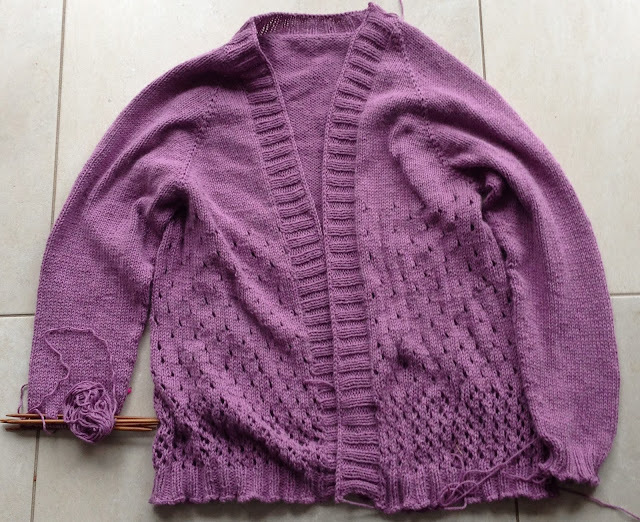 I do prefer knitting sweaters and cardi's top down in the round (no seaming required and I know I should learn to knit sleeves TAAT on circular needles but I never seem to get round to it.